Swedish melodic metal forerunners AMARANTHE have officially entered the studio to work on the follow up to 2014's breakthrough album Massive Addictive, which debuted at No. 1 on the Billboard Heatseekers chart upon release and which enjoyed healthy U.S. rock radio airplay in support of the singles "Drop Dead Cynical" and "Digital World". The new album is due out on Spinefarm in October. Watch the teaser below. 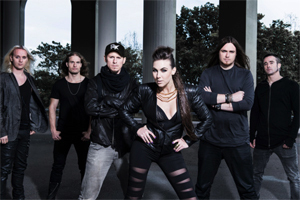 AMARANTHE will spend their summer laying waste to stages at all of the relevant European rock festivals before embarking on a near-constant global touring schedule after the album's release. "As some of you no doubt have heard by now, we have entered Top Floor studios with Jakob Herrman in Gothenburg to record our fourth album," said guitarist Olof Morck. "It is extremely exciting to be back in the creative zone after spending two years traveling the whole world in support of Massive Addictive. We will spend one month here recording drums, bass and guitars before once again moving onto Jacob Hansen's studio in Denmark for vocal recordings and mixing." He continued, "We are beyond thrilled about the new material, which is certainly AMARANTHE's most diverse so far; our trademark bleeding edge modern metal is ever present, but fused with an even wider range of genres than before, featuring everything from stadium rock, the latest in pop music innovation and danceable super-hits. Expect these tunes to enter your mind permanently, never to leave, later this year!" In other AMARANTHE news, they've racked up some new certifications. The band's single "Nexus" went gold and "Amaranthine" and "Hunger" have gone platinum - all in their home country Sweden.